By setting Compatibility Mode to Windows 8 or Windows 7. Older version of chrome (etc... version 49) Does show aero on Windows 10 without Compatibility Mode, but newer have to set Compatibility Mode. Edit: Also, last time I tried Chrome, compatibility settings for it were automatically cleared on launch. Firefox/Iron/Opera/Chrome patcher to enable Aero Glass. You must restart PC after patch. 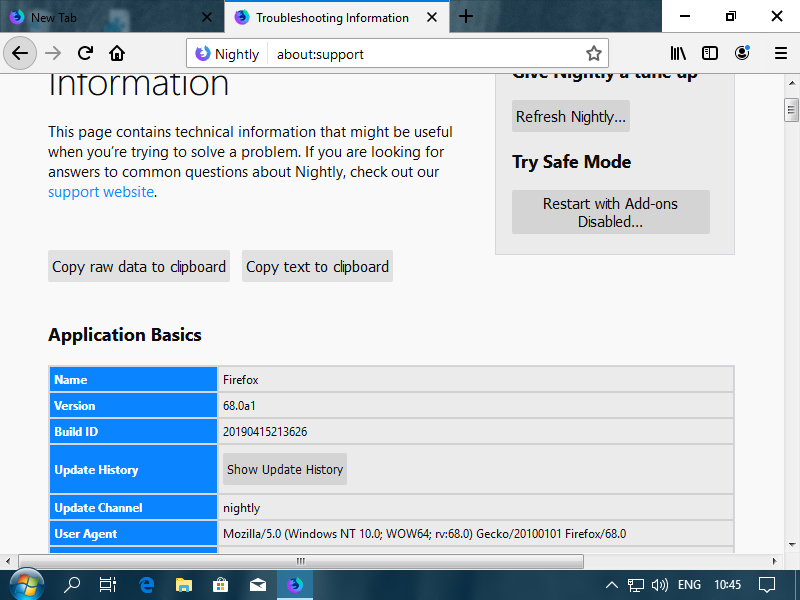 Yeah, it is working with latest Firefox Nightly, but there is one big problem with this patch, it is setting Firefox in light theme, not supporting dark one, any chance to get support for dark theme? I did found (probably) Your topic on other Russian language forum, but I'm not able to understand something there, also with translator. 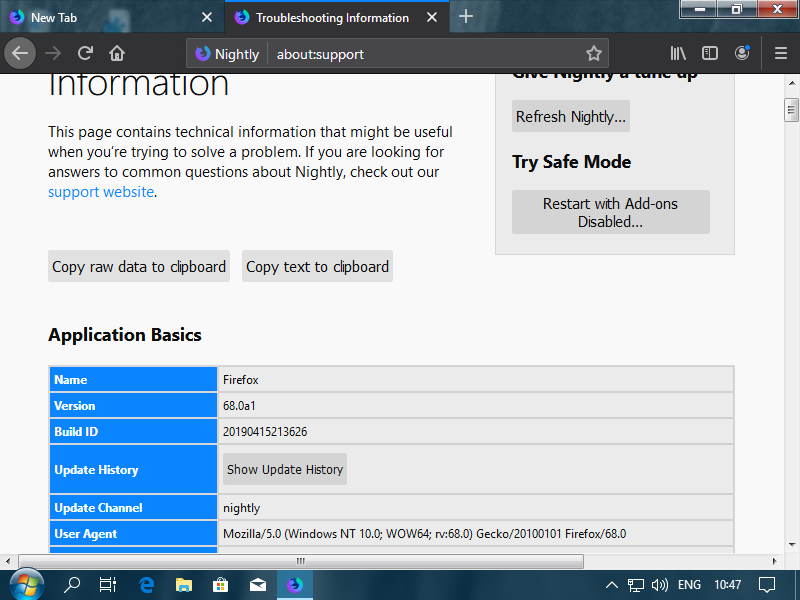 Yeah, it is working with latest Firefox Nightly, but there is one big problem with this patch, it is setting Firefox in light theme, not supporting dark one, any chance to get support for dark theme? That's because it doesn't do anything impressive, it just makes Firefox unaware of the fact that it's running on Windows 10. And since dark mode is Windows 10 thing, it won't work if it's run in the context of the older OS. Yeah, I understand this, but I;m looking for simple option to get back transparency in Firefox on Win 10 with dark theme, I can imagine that dark glass will be look superb. @Semtex You could try using a custom userChrome.css file. 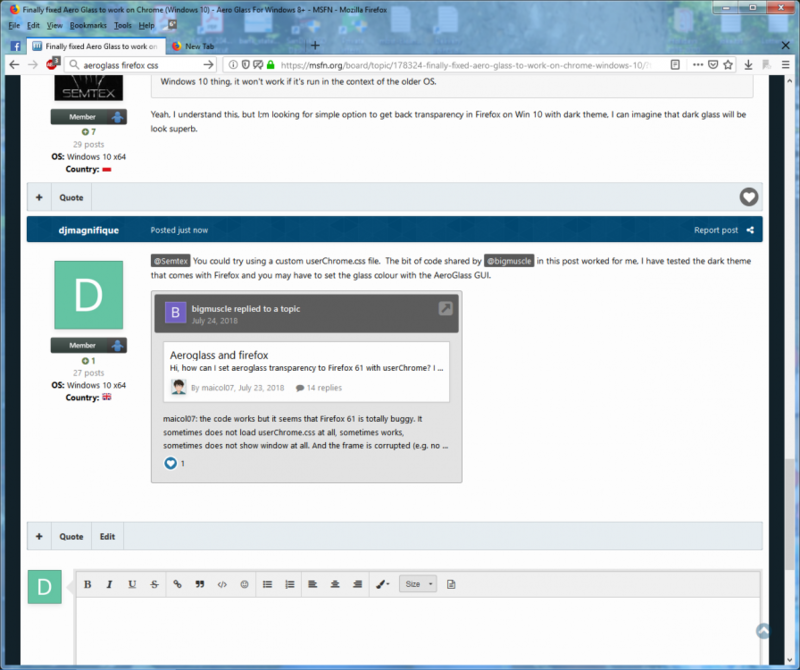 The bit of code shared by @bigmuscle in this post worked for me, I have tested the dark theme that comes with Firefox and you may have to set the glass colour with the AeroGlass GUI or Windows personalization. This is what my Firefox looks like. The problem is that apparently nobody understands how this all works internally to be able to come up with good solution. I recently asked about it here. Quick experiment with with the dark theme in Firefox and setting the colour in Windows resulted in this. You're not using userChrome.css alone, you obviously also set browser.tabs.drawInTitlebar to false. I would prefer to be able to keep tabs in the title bar, but that way, there are issues with caption buttons. Also, I remember Semtex already tried these kinds of CSS tricks, but still encountered some problems. True, but turning browser.tabs.drawinTitlebar to true only removes title bar at the top of the Firefox window for me as I have the menu bar turned on. Also i'm only working on the info from this thread and I didn't see any mention of CSS being tried. I was only offering a solution that worked for me that may or may not work for others. It all depends on what sort of layout they want. Also i'm only working on the info from this thread and I didn't see any mention of CSS being tried. People keep creating new threads for the same old problems over and over again because searching is too much of the effort for the average Joe. The problem is, that from Nightly 65 or 66 piece of code responsible for Aero Glass in frames was removed so it is hardcoded thing, I found bug on Bugzilla, @UCyborg it is not so that I don't use "search" option, I did wide searching over net for this problem and nothing works for me if we talk about CSS, I'm not master of coding but I'm playing with it since Years, in past I did some Windows 7 Themes in WSB, so I'm not greenhorn. Till now in Firefox 68 nothing works if we talk about CSS, only this hook from above, but like You mention, it is only "half way". That wasn't directed at you specifically, but those that keep creating new threads even though they could post in the old existing threads. 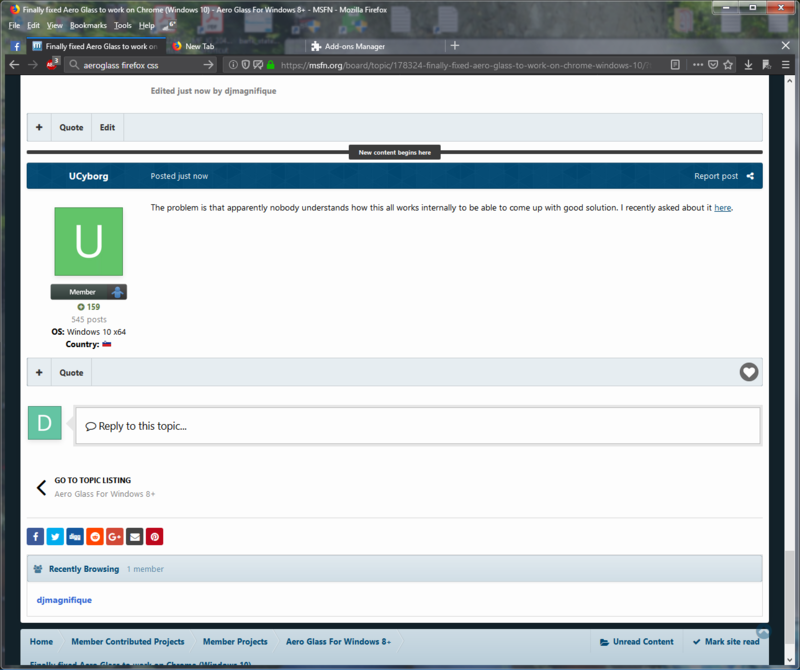 Built-in CSS sets display property of .titlebar-button to none on Windows 7, but that doesn't help on Windows 10 due to some hardcoded behavior; it just completely disables the ability to use those buttons. If you turn off critical CSS files in Style Editor such as browser.css (there are 2 files called browser.css), you can still minimize/maximize/close Firefox window with the caption buttons on Windows 7/8.x, but not on Windows 10. So yeah, not all behavior can be changed with CSS alone. It would require some modifications to Firefox's source code.